Opening the seal on a Growler full of Death. The details I could unearth on the ingredients and history of this beer are pretty minimal, but the two facts I was able to ascertain are worth noting. 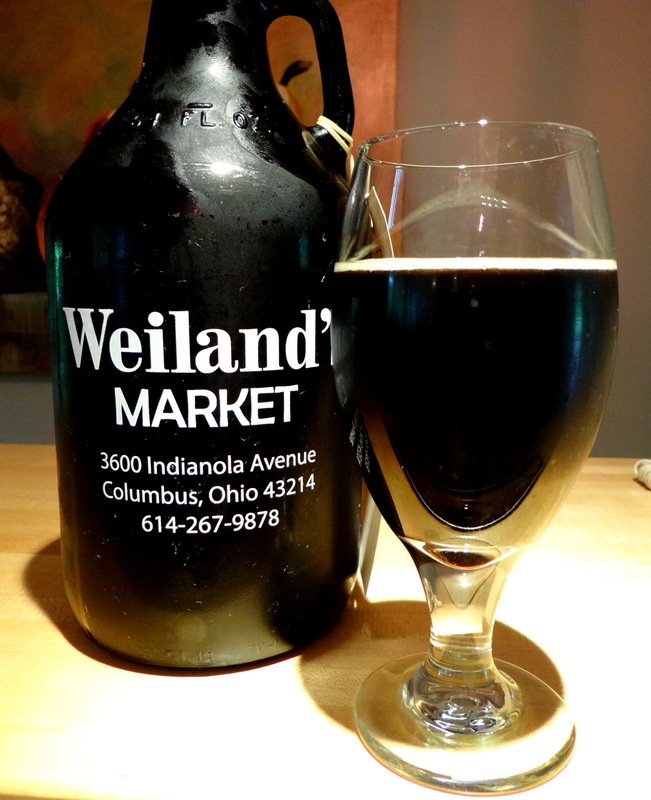 Firstly, it weighs in at 11% abv, pushing the legal limit for beer in Ohio. Secondly, it is made with Jolokai Peppers, more commonly known as Ghost Peppers, which are more than a 1000 times hotter than a Jalapeño pepper. Appropriately enough Death is jet black and pours with a minimal head that never gets more than a few millimeters high. If you hold it up to the light some ruby highlights can be seen leaking through on the edges. Thankfully the beer does not smell like death (or for that matter Limburger cheese). The nose is a little bit boozy, with a healthy dose of vanilla. If there is any aroma from the Ghost Peppers it is well masked by the other ingredients. The boozy, vanilla aroma of this beer is reminiscent of a bourbon barrel aged Imperial Stout, although to the best of my knowledge it is not barrel aged. The taste begins with rich caramel malts and accents of dark fruits, more like an English-style Barleywine or a Wee Heavy than an Imperial Stout if you ask me. Before too long the heat of the Ghost Peppers arrives, peaking at the finish and leaving you with a lingering, but very tolerable burning sensation. The mouthfeel is thick and chewy. Admittedly I enjoy spicy foods and I use hot peppers when I cook far more often than the rest of my family appreciates, but for me the heat of the peppers is just right. It’s shares equal billing with the caramel and dark fruit flavors of the base beer without overpowering them, as is too often the case in pepper beers (aka Elevator’s Ghost Scorpion Lager or Stone’s Punishment). Like hot foods in general the heat grows little by little the more you drink, although this effect is mitigated if you are eating food while drinking the beer. The alcohol is there, but seems less pronounced than it was on the nose. I speculate that is because your sense of taste and smell is occupied with everything else going on in this beer. Although I love both beer and hot peppers the combination of the two does not usually work for me. This is the first chilli pepper beer I can remember where the peppers make a balanced contribution to the taste of the beer without overpowering the other flavors. It’s not for everyone, but if you like big malty beers like Imperial Stouts, Scotch Ales or English Barleywines AND you like hot spicy food this beer is a must try. This is a limited release so you should seek it out soon if you want to try it. I have not seen any bottles of Death (too bad what a great gift idea), but it was available on tap and in growlers at various places in the Columbus area as of last week. I wasn’t aware of yahoo news so unfortunately I can’t give any advice how to get listed there. Maybe it is based on getting a certain number of hits, but that is just a guess. all is requiired to get setup? I’m assuming having a blog like yours would cost a pretty penny? You can start a blog for free using WordPress.com. The only thing needed are ideas and time to do the blog. It can cost a little if you want to expand, host videos, etc.